The staff at ESF's popular, year-old eatery, the Trailhead Cafe, has devised a way for its customers to enjoy a meal and, at the same time, reduce their impact on the environment. 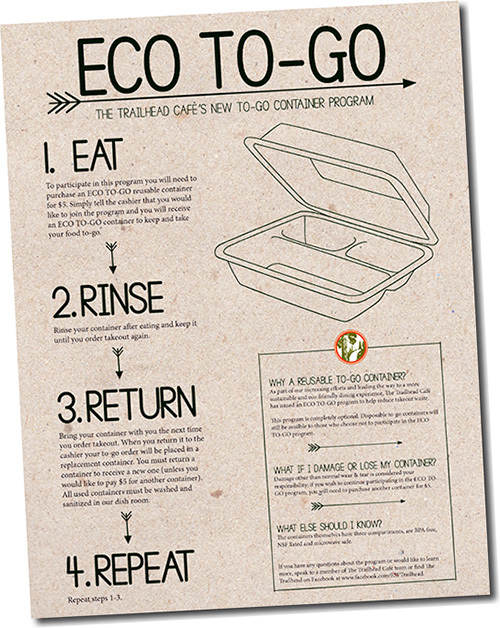 The new Eco To-Go program encourages consumers getting takeout meals to use reusable plastic containers made from recycled materials. For a $5 fee, each participant receives a container that he/she uses, rinses and returns. When that one is handed in for sanitation, the customer gets another one to use the next time. Nothing goes in the trash. "The idea is that you're buying into the program. You're buying the container, and you can use it as long as you're here. Our goal is to reduce as much packaging as possible," said James Zappola, dining services manager at the Trailhead. Students and faculty can use plates and silverware when they eat in the cafe, which is on the first-floor concourse of the Gateway Center. However, the vast majority of the Trailhead's orders are takeout, and the staff wanted to reduce waste, Zappola said. So did the students, as evidenced by the ideas they wrote down and dropped into the cafe's suggestion box. Zappola, who responds in writing to those suggestions, said students had been asking for reusable containers since the cafe opened about a year ago. The first customer to buy into the Eco To-Go program was Susan Sanford, ESF director of admissions and inter-institutional relations. Sanford eats at the Trailhead, located downstairs from the admissions office, regularly, so buying the box made sense for her. "The convenience part is worth it. The cost was negligible," she said. "I just thought it was the thing to do, especially if you're working for ESF. I'm trying to support as many sustainability efforts as I can." Sanford feels the Eco To-Go program matches ESF's mission, saying, "It's just one more element to show that every aspect of ESF looks to demonstrate how we can do things more sustainably." The Trailhead has been working with the Green Campus Initiative (GCI), an ESF club that works to increase campus sustainability. GCI has nine compost bins around campus. Since last March, the Trailhead has composted its kitchen scraps; this semester, there is a compost bin in the seating area for customers to use. Ross Mazur, GCI treasurer and co-chair of the group's garden, is proud that the Gateway Center now has a large compost bin available for anyone who eats at the Trailhead. "I think that's huge that it's been put there," he said. Both the club members and cafe staff had heard complaints since the building opened about the lack of a compost bin. The Trailhead has also made new efforts this semester to help consumers separate their trash, recycling and trays, said Zappola. GCI members were happy to hear about the new reusable container program. "There was definitely interest and excitement that it was a thing," said Mazur. Sanford said the effort reflects the campus culture, a thought echoed by Zappola and William Gokey, chef manager for the Trailhead. "The campus is making not only a conscious but a significant effort to have as little impact on the environment as possible. The fact that we're using a container that is compostable and recyclable shows the effort from the campus," Zappola said. And Gokey said, "There is an ongoing effort to make things more and more sustainable. As more opportunities present themselves, we're trying to stay tuned." The Trailhead and GCI hope to coordinate using herbs and greens, including spinach, arugula, cilantro and basil, from GCI's on-campus garden in the future. The club members are optimistic about receiving funds that will allow them to buy garden accessories to improve growing conditions in their greenhouse, located up the hill south of Bray Hall. "There's a lot of firsts going on on this campus with the cafe," said Zappola.